Our Quote of the Week emphasizes the role of Community Action in tackling poverty. Initially a concept that emphasized local service to empower individuals and families dealing with economic hardship, Community Action was central both for the War on Poverty and for Sargent Shriver, who believed that to truly empower people, you had to do so on their terms, not according to a cookie-cutter definition of success or prosperity. helping people stay safe and warm in affordable housing with functioning electricity and heating. The degrees of success of local Community Action agencies varied from place to place, and the programs, with their model of empowering local citizens, caused controversy in some jurisdictions. But the overall success of Community Action is undeniable, and today, there are over 1,000 Community Action agencies that continue to serve residents in neighborhoods all around the United States. 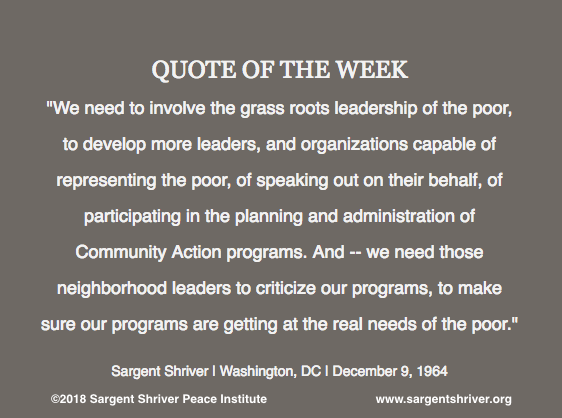 One final point about our Quote of the Week: it’s notable that in speaking about Community Action, Sargent Shriver welcomes criticism from community members as part of what he envisions for the program. His openness to criticism shows a leadership quality that continues to be valuable today: the willingness to listen, to learn, and to adopt solutions that truly benefit those for whom those solutions were designed. If you’re interested in learning more about the history of Community Action, click here. And if you’d like to connect with your local Community Action agency, click here.